This is our flagship wine, a co-fermented field blend of grapes from our estate. "Fait accompli" translates from French to English as "accomplished fact." Fashioned in the style of red wines from Bordeaux, our wine is a full flavored, deeply colored, highly extracted, yet civilized, Claret. 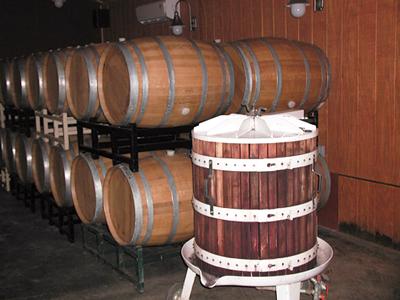 Winemaking (to use the popular term) at Westbrook Wine Farm is atypical, in that we say and mean that our wine is literally "crafted" in the vineyard. Although there is some variation, allowing for changes from one vintage to the next, our proprietary field blend is approximately 55% Cabernet Sauvignon, 20% Cabernet Franc, 10% Malbec, 8% Merlot, 7% Petite Verdot, and 1% Carmenere. Harvesting and co-fermenting all six varieties together creates a flavor bond and complexity, unlike anything that can be achieved by wine blending. This is not to say our method produces wine that is superior to that made by wine blending, but our co-fermented wine is decidedly more complex and, fortunately, pleasing to our customers. Some farm produce is dried, frozen, smoked, pickled or brined. Crushing, adding yeast, hand-punching the cap in small open fermenters, pressing into barrels and bottling is our way of preserving the fruit that we grow. My daughter came down for the annual Oscar party with 9 bottles of her favorites from Russian River and points east!!. Saturday, I uncorked THE BOTTLE. Karen was impressed with the use of the warm water and knife held at 45 degrees to expose the cork... Anyway, a very long story reduced to its essences, your wine was amazing at the first sampling. An hour later, even more so. The next day, the wine had relaxed and the flavor and after taste lingered as a delicate balance to be savored and enhance the evening with friends and family. Thank you so much, it was worth the wait. Well, the Red Sox pulled off a big one last night. Bruce, being a true Boston sports fan, was biting his nails and waiting for the Colorado Rockies to spoil the hope of a World Series sweep, but they just went out with a whimper. I knew we would be watching grown men bathing each other in Champagne, so I decided that the occasion required something more. As the 9th inning began I held the wax in the palm of my hand, as instructed, careful not to warm the bottle. With the first out in the bottom of the 9th, I unfolded the blade of the opener. As the young pitcher jumped into the air in celebration of his first championship, I carefully cut the wax on a 2004 Fait Accompli. Bruce, Amy, and I toasted the World Champion Red Sox with the best beverage in the house. It was funny how quickly our attention turned from the baseball celebration to what can only be described as surrender to the taste of your wonderful wine on our tongues. Let others celebrate with bubbly white wine, we prefer to mark any grand occasion with Fait Accompli. Ray and Tammy, thank you for pursuing your passion. You have made the world a better place. After two years and over 160 cuttings planted, we have but one surviving Saint Macaire vine in our Museum Vineyard Preserve. Botanist, philosopher, and blue water seaman, J. Nick Goldman, on the other hand, was able to greenhouse coax nine of the cuttings into their second season. Following our practice of varietal purity, we prefer to establish and maintain our Museum Vineyard Preserve vines un-grafted on their own roots. 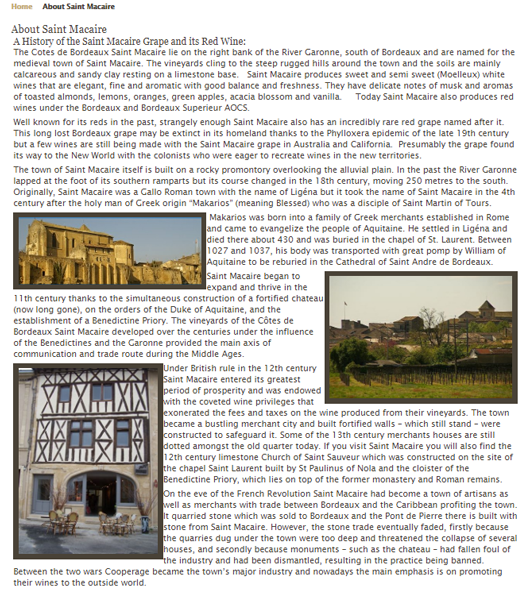 Saint Macaire is one of the eight red grape varieties originally approved for inclusion in red Bordeaux and Meritage labelled wines. Because of its aversion to cool wet climates, you will find little to no Saint Macaire used in Bordeaux today. This completes our collection of all eight of these varieties here at Westbrook Wine Farm. We believe that we are one of but two such vineyards in California, today. 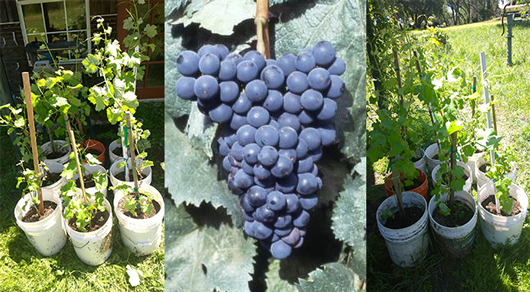 Although we have yet to experience its contribution to our co-fermented Museum blend of eight heritage clones of Cabernet Sauvignon, Gross Verdot and Cot (Malbec from Cahoors), we are nonetheless very excited at the prospect. Come taste with us soon?